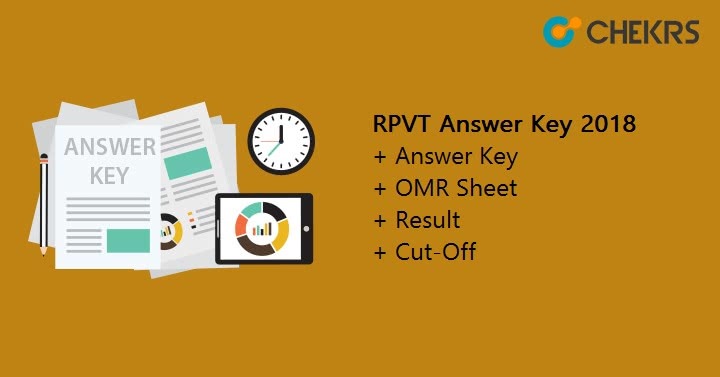 RPVT Answer Key 2018: The RPVT Entrance Exam has been conducted successfully on 10th June 2018, All the candidates who appeared in the exam are now waiting for the RPVT Answer key. According to the RPVT official notification, the answer key will be released online at the official website rajuvas.org on 13th June 2018. RPVT stands for Rajasthan Pre Veterinary Test, The exam is conducted every year to provide admission to B.V.Sc. & A.H. degree courses in the veterinary colleges and institutes come under (affiliated) Rajasthan University Of Veterinary and Animal Sciences (RAJUVAS). In this article, we will talk about of-course RPVT Answer Key, RPVT 10th June Exam Analysis, grievances, OMR Sheet, and Results. The Complete RPVT Schedule has been already released with the official RPVT Booklet. According to the Booklet here is the table of events and their dates. The Answer key will be released on 13th June and the result will be announced on 02nd July, other details are given below. The RPVT 2018 Answer Key will be available online on the official website of Rajasthan University of Veterinary & Animal Science which is rajuvas.org, So candidates have to visit the official website to download the RPVT 2018 Answer key. To download the Answer key candidate can follow the step given below. First of all candidates have to visit the official Website. On the Home page there will be a ‘NEWS & UPDATES’ notification board. In this board candidates have to find the ‘RPVT 2018 LINK’ and Click on it. Now on the Board a link with title ‘RPVT-2018’ text will appear. Click on it. On the Next Page click on ‘Answer Key RPVT-2018’. And download the RPVT Answer Key. After the Answer key, Image of RPVT OMR Sheets 2018 and Responses graded by the Machine of all the candidates will be released on the official website on 25-06-2018. Candidate can download these document via visiting the Official Website. If candidates found any mistake in the OMR Answer Key they can fill Grievances using the Email. Candidate can Estimate their marks using the RPVT Marking Scheme. We are also providing the marking scheme here. In the Paper Each question carries 4 equal marks. For each correct response, the candidate will get 4 marks. So Add 4 marks. For each incorrect response, 1 mark will be deducted from the total score. So reduce marks. If no response is indicated for a question in the OMR answer sheet, then no marks will be deducted from the Total score. If candidates found any mistake in the Answer key they can fill Grievances, if any. The Complain/ Grievances can be filed to the Convener, RPVT-2018 by E-mail. Candidates have to attach all the required documents/ proof in the email which can be submitted from 13-06-2018 to 15-06-2018 up to 5.00 PM for Answer Key and from 25th June 2018 to 27th June 2018 up to 5.00 PM for RPVT OMR Sheet. The Result will be released at the official website rajuvas.org, on 02nd July 2018. Candidates can download Rajasthan Pre Veterinary Test 2018 Marks Sheet from the official website. With the Result declaration, Cut-Off Marks and Merit list will be also released. Candidates are advised to visit official Website regularly to get latest updates. Candidates have to obtain more than the RPVT 2018 Cut-Off Marks, to appear in the counseling. The Cut-off marks are the minimum marks, Candidates have to get to qualify the Exam. The Cut-Off marks for the year 2018 are not available yet so we are including RPVT 2017 Cut-Off Marks, So you can estimate the range of this year’s cut-off marks. On the basis of the Cut Off Marks, the authority RAJUVAS will also prepare the RPVT 2018 Merit List as per their marks. Candidates can download RPVT-2018 Marks Sheet from the official website. On the basis of Merit List, Candidates will be called for counselling and Admission Procedure.